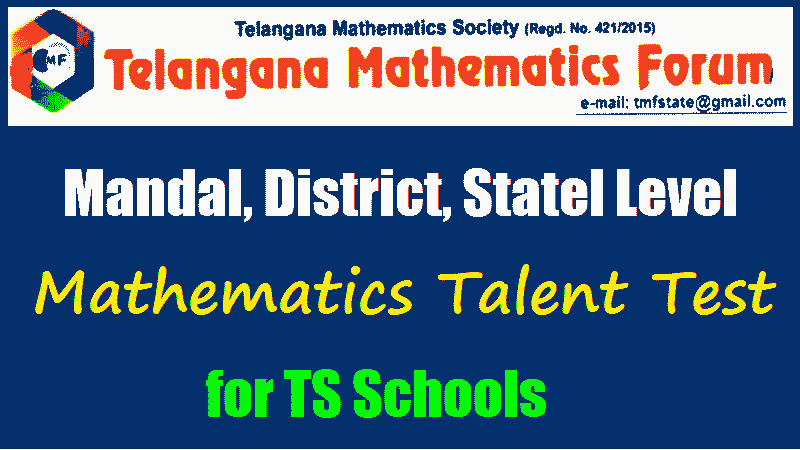 Mandal, District, Statel Level TMF Mathematics Talent Test 2018-2019 for TS Schools, TMF Maths Talent Test 2018, Telangana Mathematics Forum Maths Talent Test 2018, State Level Mathematics TMF Talent Test 2018-2019, Telangana Mathematics Forum (TMF) is going to be conducting Mathematics Talent Test in 3 stages for class X students of TS Schools o encourage Mathematics skills and to enrich the mathematics environment among the students and teachers in month December, 2018. TMF is going to conduct Mathemaatics Talent Test in 3 stage for class X Students of Govenrment, Local body, KGBV, TSWREIS, MJPTBCWREIS, TREIS, TMREIS and Model schools to encourage Mathematics Skills and to enrich the Mathematics Environment among the students and teachers in December 2018. Sub: SCERT, Telangana, Hyderabad - State Level Mathematics TMF Talent Test 2018-19 - Reg. c. State level Maths Talent Test at ZPHS Hayath Nagar, Ranga Reddy District on 20.12.2018. In view of the above, the Telangana Mathematics Forum (TMF), Hyderabad has requested to give on duty facility for the mathematics teachers those who are attending the district level test and state level test i.e. on 17.12.2018 and 20.12.2018. Therefore, all the DEOs in the state is requested to depute the Mathematics teachers to attend the said talent test organized by the Telangana Mathematics Forum (TMF), Hyderabad, at district venues @ 1 teacher as observer per district and for attending the State Level Talent Test at ZPHS Hayath Nagar, Ranga Reddy District on 20.12.2018 @ 6 teachers per district and organizing committee members of TMF. Their absence to the school on the said days is treated as on duty on submission of attendance certificate issued by Telangana Mathematics Forum (TMF). To The Director, SCERT, TS, Hyd. Sub:: 2018-19 STATE LEVEL TMF Talent Test Reg. Govt. & Local Body, KGBV, TSWREIS, MJPTBCWREIS, TREIS, TMREIS, Model schools to encourage mathematics skils and to enrich the mathematics environment among the students and teachers conducting competition in 3 stages in the month of November & December, 2018. Mandal level at respective mandal head quarters before 17-12-2018, District level at respective District head quarters on 18-12-2018, State level at ZPHS Hayath Nagar, Ranga Reddy District on 20-12-2018.
teachers who attend the programs at District Venues as observers and state level at Kakatiya University, Warangal. We are here to serve the students & Teachers community regarding mathematics. We are ready to work with the Department of Education.